Other recent presentations include the University of Colorado at Boulder and for an international cast of Up with People. We had a great time with both visits and want to express our appreciation to the UwP staff as well as to the following people at CU Boulder: Melissa Rougeaux and the International Club, Jeanne Ulmer, WCI team member Ben Grafström and WCI alumnus Nick Zendejas. 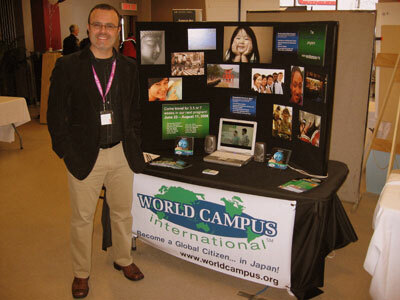 This weekend, Bob will attend the Colorado–Wyoming International Opportunities Fair at Colorado State University in Fort Collins followed by a three week visit to Europe including stops to universities, schools and institutions in Switzerland, Germany, the Netherlands and Denmark between February 20th – March 12th. Stayed tuned for more updates and be in touch with Bob at rsloat@worldcampus.org if you want to see if he will be at your school and arrange a meeting with him! Previous PostCheck out the Class of 2007 tee shirt design!Next PostWelcome Party in Omura City for the Feb – April 08 Class!